What in Blazes Were Heat Rookies Up To? 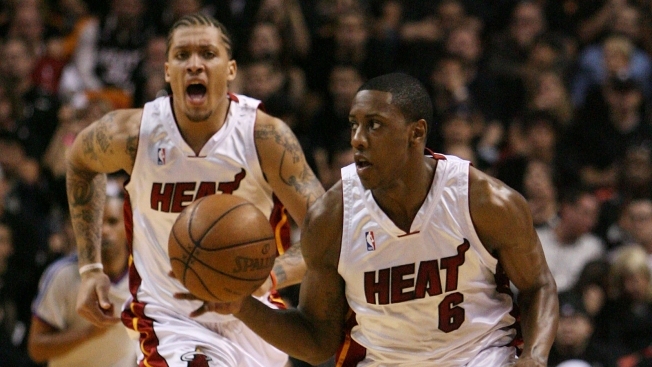 The Heat's accounting staff probably wish Michael Beasley and Mario Chalmers were just a bit younger. Spankings don't lead to carpel tunnel syndrome like processing a bazillion payroll deductions do. Turns out the two rookies didn't need breaking in only on the court -- both players were "continually" fined throughout the season for team violations off the court. It got so bad, coach Erik Spoelstra said, even non-coaching staff members were pulling the two aside to talk, and news of Beasley's hefty deductions in particular spread across the league. Spoelstra added that none of the fines were on par with the $50,000 and $20,000 assessed to Beasley and Chalmers, respectively, after a fall hotel incident at the NBA rookie camp that reeked of marijuana. But he refused to say what mischief the two were constantly up to, other than that none of Beasley's issues was being late or missing practice. "There's other things," he said, while reiterating that Beasley was completely coachable he once managed to get himself on the practice floor. "Dress code, things of that nature." Good gracious, did they show up for road trips in thongs? To be fair, the Heat have one of the more lengthy rulebooks in the league, and GM Pat Riley has always been a stickler -- not to mention a very particular dresser. Add two guys who likely weren't made to do too many distasteful things in their star-making college careers -- one of whom joined the team at 19 and still watches SpongeBob Squarepants -- and you have a learning curve strewn with dough shot right back out of their bank accounts. Both players say that after a rough first year in the compliance department, they have a handle on what's expected of them. They'll probably want to make double sure of that, lest an impatient Riley slap back braces on those poor accountants and ask them to help the two pack.